Friday, June 12, I flew out from Houston to Sacramento to attend my daughter’s graduation at the University of California at Davis. Shortly after arriving at my motel in Woodland, my daughter called and asked if I had arrived. We met up with each other at her apartment on campus. After introducing me to her roommates and showing me her room, we headed for downtown Davis. First order of business was lunch at Burgers and Brew. From there, we spent the next five hours on a walking tour of the downtown area and the campus. With most cities today, downtowns are a throwback to a bygone era. With their crumbling brick facades, boarded up windows, and a spattering of antique shops, attorney offices and banks, such places leave you wondering what they were like when “downtown” was the focal point of the community. Downtown Davis, however, is the focal point for this community: dynamic, vibrant, with hundreds of people milling about on foot and malingering in its shops, art galleries, and coffee houses. With its tree lined streets, its ambiance is what many shopping malls try to achieve but never quite get right. While walking along with my daughter, I couldn’t help noticing all the bicycles whirring by. On the sidewalks, more bikes were parked in racks then there were cars parked on the street. Davis is sometimes referred to as the “Bicycle Capital of the United States.” The streets have designated bike lanes, and even one of the traffic lights is bicycle friendly. Instead of your typical red, yellow and green traffic light, this one uses red, yellow and green bike icons. We visited a couple of art galleries, and then walked onto the campus that abuts the community. After walking quite a distance, I mentioned to my daughter that the area seemed much bigger than I thought. “Biggest campus in the UC system,” she said. I later learned that the campus is spread over 5,300 acres. The highlight of my campus tour was the UC Davis Arboretum. As we stood on the knoll looking at the green hillside nudging downward to the pond, I could see why my daughter saved this particular place for last. Both a park and a garden replete with several varieties of trees, plants, flowers, and wildlife, there are several pathways to take for an easy stroll. And if you want to sit a spell to indulge in quiet contemplation, you have your choice of several benches placed underneath the boughs of the trees, in the flower gardens, and along the edge of the pond. She led on as I followed her through the Redwood Grove. Among the redwoods, especially along the waterway are succulents and deer grass indigenous to California. We each took a turn to lean up against one of the small giants to take a picture of each other. We capped off our excursion by walking back to Davis to where I had parked the car. Dinner that evening was at Caffe Italia. A more enjoyable recommendation could not have been made. Before sitting down to a table, you have to order at the counter first. At 8 am in the morning the line was considerable, but the wait was worth it. I had the Amaretto French Toast with almonds , served with pure maple syrup. The dining area has small tables spaced closely together. You can also eat at the tables outside on the sidewalk terrace. The atmosphere feels more European than American. If I were to return to Davis for another visit, this place would be first on my list. I knew it would be sometime before I would eventually catch up with my daughter again. After we had had dinner last night, she spent the evening hanging out one last time with her college friends. After finishing breakfast, I spent the rest of the morning playing tourist. I explored almost every inch of downtown, browsed several of the shops and bookstore, and watched an Amtrak train pull in from Sacramento and pull out headed for San Francisco. It was around 11 am. From the train station, I walked down 2nd St to C St and made a beeline to the Davis Farmer’s Market. California is world famous for its agriculture. There isn’t any kind of grain, fruit, or vegetable that doesn’t grow in this state, and considering the numerous vendors here this morning from local farms around the area, the abundance is quite evident. Most everything offered is organic and fresh picked. At $3.20 a pound, it was hard to say “No” to a couple of pounds of Bing cherries. I also bought a pint of blueberries for $2.75 and a pint of Santa Maria strawberries for $3.50. I spent the next hour and half sitting on a park bench gorging myself. The park was filled with people spread out on the lawn with blankets and picnic baskets. I observed a father helping his small daughter get a kite up into the air. Other children were running around in a game of tag. Dogs were chasing after Frisbees and balls. Several small groups of people were engaged in simple conversation. And the music from the live bands playing at the market made it feel more like you were at a festival, a celebration of joining together with family, friends, and even complete strangers. This is a community that basically likes to hang out together; its people, very friendly and helpful. Liz met up with me shortly after. She asked me if I had had anything in mind for lunch. Considering I was quite stuffed as it was, I said anything light would be fine with me. She bought a bag of pumpkin bolani bread and a small tub of orange lentil sandwich spread. We headed off to the Arboretum on campus and shared a quiet lunch together on one of the benches. Later that evening we drove to Sacramento to meet up with her mother and a friend of hers for dinner. Graduation was Sunday morning at 9. I arrived at The Pavilion at 7:30 to make sure I got a good seat within viewing distance of the stage. Considering the cavernous size of the facility that is used mostly for athletic events, getting good pictures proved a real challenge for my digital camera. The lighting and distance made it impossible to get a clear picture of my daughter as she sat with her class waiting for the commencement to begin. Chancellor Larry N. Vanderhoef gave the Welcome speech, which did not seem very encouraging. He congratulated the students on their hard work and significant achievement, but then apologized that many of them might not be able to find jobs because of the suffering economy. After the ceremony, her mother and I joined together with other friends who came to celebrate the occasion for picture taking with results that were much better. My daughter is at least fortunate that she will have a job as a reservations coordinator at UC Davis throughout the end of the summer. She hasn’t decided whether she wants to pursue a career in radio or TV broadcasting, but at least she has a few months to consider her options and to apply for positions. As I walked back to my car after we had said our goodbyes, it struck me how odd this journey through life can be. It was 29 years ago when I graduated from California State University Long Beach with a Bachelor’s Degree in English. Then, I did not reflect on what had transpired in the past; instead, I looked toward the future. I envisioned myself developing a career as a writer and teacher, and even dreamed of maybe teaching overseas someday. 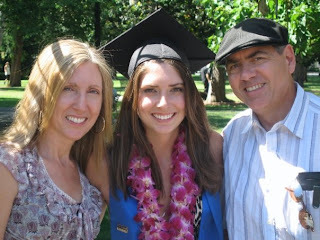 It never occurred to me, though, that I would have a daughter who would one day graduate from UC Davis. I turned and looked at the building where my daughter was settling in for her day at work. As she shapes her dreams over the summer as to what the beginning of her next journey will be, I hope that 29 years from now she will be as amazed with the events that have transpired in her life as I am with the events that have transpired in mine. Featured in the Culture section of Blogcritics. you're a long time between posts, but it was so worth it. I have a craving to visit Davis, although it's not likely since I need a passport and can't seem to get around to doing the paperwork. thanks for coming by. And glad you're doing well. I've lived in California for most of my life, but I've yet to visit Davis. Thanks to this post, I want to visit it now. :) Congratulations to your daughter on her graduation. Congratulations to your beautiful daughter! Judging from her confident smile and her lineage, I suspect she will succeed at whatever she does. I visited Davis a couple of years ago as part of my book tour, and loved it. Yes, it has been a long time. Takes time to get settled to a new area before you can start writing about you're at, at least with me anyway. Thanks for coming by . . . Thank you. When I lived in California, I had heard about Davis, but didn't think it would offer much for a visit, so I never went until my daughter's graduation. It's the perfect place for a writer to get in a little R & R.
Thank you for your complement. Davis was not at all like I had expected, and I can't wait for another opportunity to visit.